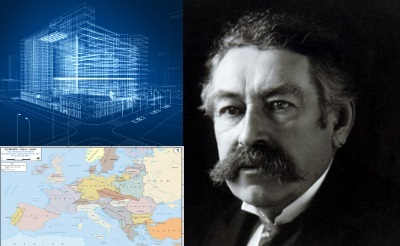 Ariste Briand devised the so called Briand plan in 1929. The plan concerned the creation of a federal union of European States within the framework of the League of Nations. Who was Ariste Briand ? Ariste Briand was a French Statesman. He served 11 times as Prime Minister for France during the time of the French Third Republic. He was born in Nantes, 28th March 1862, and died on 7th March 1932. Whilst studying at the Nantes Lycée, Briand developed a close relationship with Jules Verne. Briand read Law, and moved into politics, writing articles for the anarchist journal Le Peuple, and became a politically active and prominent membere of the movement for the formation of trade unions. Briand became a leader of the French Socialist Party from 1894, and later declared himself a strong partisan of the union of the Left, aka the Bloc, in order to check reactionary Deputies on the Right. Briand succeeded Clemenceau as Prime Minister in 1909, serving until 1911. Briand served briefly again as Prime Minister in 1913, and following French defeats in WWI, Briand became both Prime Minister and Foreign Minister in 1915, taking over from René Viviani and Théophile Delcassé respectively. He resigned in 1917 following dispute over the prospective Nivelle Offensive. In 1921 Briand returned to power and supervised the French Role in the Washington Naval Conference of 1921-1922. Due to German intransigence which led to failure in reaching agreement over reparations, Briand was succeeded by Raymond Poincaré. Brand’s more conciliatory style made him more acceptable in the wake of the Ruhr Crisis, and in 1925 he returned to the Quai d’Orsay as Foreign Minister, a role he occupied until his death in 1932. In 1927, Briand and US Secretary of state Frank B Kellogg settled a universal pact outlawing war which led in 1928 to the Pact of Paris: The Kellogg-Briand Pact (27th August 1928). Whilst working on the Locarno Treaties, Briand developed a plan for addressing what he saw as a fundamental problem in the structure of Europe for guaranteeing peace post WWI. Briand did not revisit this concern publicly again until 1929 when he brought his idea into the public and political domain. This started with an address to the Council of the League of Nations in Madrid of that year, followed by Press releases on the 10th July 1929. In the address he went on to present his plan to the government and discussed the possibility of permanent contact between European governments. Why did Briand revisit his concerns ? i) In December 1928 the Council of the League of Nations in Lugano saw confrontation between Stresemann and Zalewski. There was a problem with German minorities separated from Germany as a result of the treaty of Versailles, and German revisionism. ii) There was general disappointment with the Kellogg-Briand Pact as it became clear that the law was not working. iii) The conference of the Hague, 1929 and the Young Report. This caused the estrangement of Briand and Stresemann, a division between France and Germany. Briand formally presented his plan for a European Federation at a speech on 5th September 1929 given to the 10th General Assembly of the League of Nations in Geneva. The French Government issued a memorandum on the Briand Plan on 1st May 1930. The prescription of « Fédération fondée sur l’idée d’union et non d’unité » : Federation of Union not Unity, is of fundamental importance to Briand’s idea, and indeed Federalization for Europe. This builds on the model of Federation described by Proudhon in ‘Du Principe Fédératif’, 1863. Proudhon considers government to derive from systems of organization driven by two diametrically opposed forces: Authority and Liberty. The dialectic which exists between these desires, reflected by a societies struggle between faith and reason, result in individual systems of government emerging which Proudhon considers to be ‘sketches’. Proudhon isolates Federation in Chapter VII as a more certain system of government which can bind the sketches together through contract and alliance in order to ensure peace, mutual economic prosperity and stability. An important point which Proudhon argues is that Federation should stabilize the balance of the forces of authority and liberty preventing polarization occurring within Federated members, and indeed the Federal entity itself. Briand’s plan was broadly disrupted in 1930’s Europe as European States polarized along these lines, leading to a break down in the international order and ultimately WWII: The social catastrophe of which Briand foresaw the possibility of in 1926 was then realized. Federal authority requires the consent of member States in recognizing the sovereignty of the Federal entity. Proudhon points out that such consent does not necessitate the release of sovereignty by member states. The Federal authority should respect the sovereignty of member States as per the contract that has been entered into when the member States recognized the Federal authority. ‘The structure of the United States of Europe, if well and truly built, will be such as to make the material strength of a single state less important. Small nations will count as much as large ones and gain their honour by their contribution to the common cause. There is a slight problem here as this increases the requirement for the Federal Authority to be authoritarian. That was an understandable desire in the aftermath of WWII, but for modern liberal Europe after 70 years of peace, such an expression by a Federal Authority would likely result in reaction among prospective member States which would lead to their internal polarization to either meet or reject the demands of the Federal authority. That is being seen at this time of writing and may lead directly to the scenario which played out in 1930’s Europe that resulted in WWII. At the Eleventh Assembly of the League of Nations, between 11-17 September 1930 the French plan was discussed. On September 11th, A report was issued on the Briand Plan which led to the creation of the Commission of Enquiry for European Union (CEUE) on the 17th September 1930. The first session fo the CEUE was held on September 3rd, and the CEUE operated until 1932, ending with the death of Briand in March of that year. After the death of Briand the Federalization of Europe was put on hold. This was in part due to the loss of its key proponent, but also due to the events which led Europe to WWII. Alexis had been exiled by the Vichy government in 1940 and moved to the US. He had served as a the French diplomat to China, and is more widely known as a poet. Leger had come to prominence previously when the French press on the right (Le Figaro) and extreme right (L’Action française) had attempted to destablize him and Briand’s Memorandum in what is known as the ‘Case de Noblet-Briand-Leger’ This dated back to 1928, initiated when a confidential document was leaked in the Hearst press of the US leading to the derailing of the Franco-British negotiations by painting them as being against Germany. It should be understood that Hearst supported the Nazi regime at the time, and the French Right used such tactics against the Left. The 3rd secretary of the Embassy, Jean de Noblet, was held responsible for the leak, working with a journalist acting on behalf of Hearst. This led to Hearst himself being turned away at the French border in 1930. The ideas within the Briand plan were revived in Europe after WWII and were expressed by Churchill and Monnet in particular. The main proponent of an earlier and competing idea for European Union, the Paneuropean Union, Count Richard Nikolaus von Coudenhove-Kalergi, attempted to contact Leger in the US. Kalergi himself was in the US at that time. Note: More background is provided in the ‘Post-War German-Austrian Relations, The Anschluss Movement, 1918-1936’ chapter cited above, including the detail that the Paneuropean model sought to explicitly exclude England and Russia from its vision for European Union. ‘What is this sovereign remedy?